Submitted photo Kraig A. Hagler was sworn in recently as Greene County treasurer by Judge Adolfo Tornichio of the Greene County Common Pleas Court, Juvenile Division. Hagler was appointed by the Greene County Republican Central Committee to fill the unexpired term of Richard Gould, who is now serving as a Greene County Commissioner. A public swearing in ceremony will be held at a later date. Hagler’s past financial experience includes management of the Key Bank branch in Xenia, and serving as a licensed investment advisor for Edward Jones in Beavercreek. He, his wife Christina, and their 19-month-old son, live in Xenia Township. Kraig A. Hagler was sworn in recently as Greene County treasurer by Judge Adolfo Tornichio of the Greene County Common Pleas Court, Juvenile Division. Hagler was appointed by the Greene County Republican Central Committee to fill the unexpired term of Richard Gould, who is now serving as a Greene County Commissioner. A public swearing in ceremony will be held at a later date. Hagler’s past financial experience includes management of the Key Bank branch in Xenia, and serving as a licensed investment advisor for Edward Jones in Beavercreek. He, his wife Christina, and their 19-month-old son, live in Xenia Township. 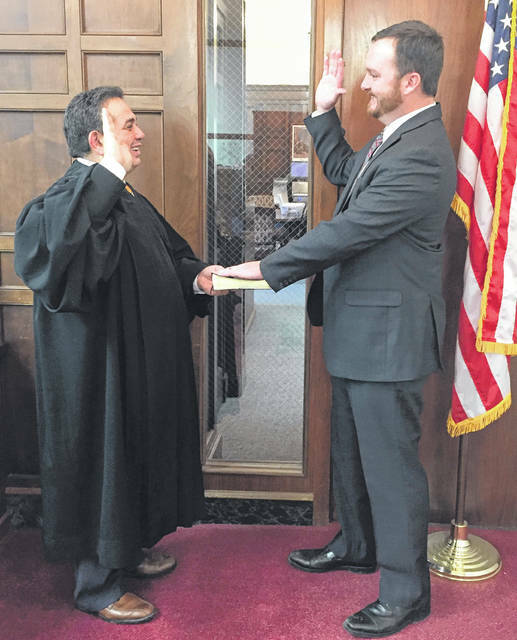 https://www.xeniagazette.com/wp-content/uploads/sites/32/2019/02/web1_Hagler.jpgSubmitted photo Kraig A. Hagler was sworn in recently as Greene County treasurer by Judge Adolfo Tornichio of the Greene County Common Pleas Court, Juvenile Division. Hagler was appointed by the Greene County Republican Central Committee to fill the unexpired term of Richard Gould, who is now serving as a Greene County Commissioner. A public swearing in ceremony will be held at a later date. Hagler’s past financial experience includes management of the Key Bank branch in Xenia, and serving as a licensed investment advisor for Edward Jones in Beavercreek. He, his wife Christina, and their 19-month-old son, live in Xenia Township.